Cloudy skies. Low 67F. Winds SE at 5 to 10 mph..
Cloudy skies. Low 67F. Winds SE at 5 to 10 mph. Cheers and Jeers is a collection of quick hits of praise and comments on local, state and national issues. The Sun encourages readers to submit their own Cheers and Jeers. 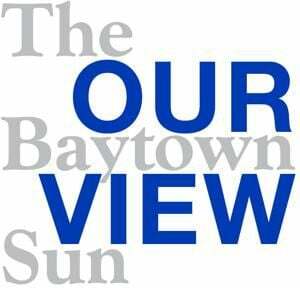 Send submissions to: sunnews@baytownsun.com. • Cheers to the Goose Creek CISD’s Teachers of the Year. Teachers were selected from each campus in the district. Those recognized were Jessica Vega, Jackie Brown, Neisa Villegas, Ciara Marks, Pam Bradford, Stacia Laird, Esmeralda Cantu, Adriana Cienfuegos, Brandy LaBouve, Robin Edwards, Ofelia Wells, Rovena Moreno, Kristin Reyes, Janette Kelley, Amy Serrano, Anna West, Teresa Black, Margaret Cayton, Jennifer Martin, Tracy Gaston Gray, Amanda Majeed, Valerie Currie, Jennifer Hollis Ashworth, Lauren Hoyt, Angie Johnson, Rachel Prettyman, Janoy Roberson and Ian Sobczak. Congrats to each of you on a job well done. • Cheers to the Readers’ Choice winners which will be revealed in a special section in the Thursday Baytown Sun. The winners are a collection of businesses and personalities that have been voted on as favorites by the public. It is comforting to see those banners around town. • Cheers to President Trump’s visit to Crosby and the outpouring of support. For a town that has been through school funding issues and a recent fire, the visit provided a boost to the community. It was an opportunity to be showcased and the town responded. • Cheers to the City of Baytown and its lineup for the upcoming 4th of July celebration. On July 3, Bag of Donuts will open for the Village People. Independence Day will feature Houston native RL Bell as the opening act. Velma and Stephens County Oklahoma native Joe Diffie will follow and Vidor’s Tracy Byrd will hit the stage prior to the fireworks display. There will be absolutely no reason to leave town for entertainment in July. • Jeers to the UIL for its selection of an overmatched officiating group to the Region III-5A soccer tournament. The officiating crew lost control of the match between Goose Creek Memorial and Kingwood Park and had no business officiating a regional semifinal. Neither team distinguished itself with a number of yellow cards as they failed to rise above the nonsense. In the future, the UIL should remember teams playing four rounds deep have distinquished themselves and deserve a crew worthy of the moment.